He repeatedly posted anti-Ukrainian articles on separatist-controlled websites. The Security Service of Ukraine (SBU) has deported Belarusian national Pavel Karnazytski and declared him persona non grata for three years. He was a frequent quest of various TV shows which he attended as a political observer. 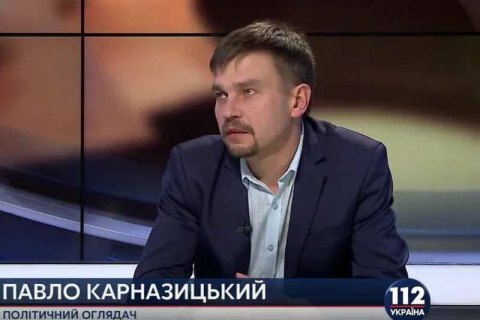 "The SBU has blocked the destructive activities of Belarusian national P. Karnazytski who distributed anti-Ukrainian propaganda in the territory of our state. Special service operatives learnt that the foreigner, who had been staying in Ukraine illegally, publicly spread fake information. In particular, in his speeches on some TV channels he put in question the internationally recognized evidence of the presence of the aggressor state's troops in the temporarily occupied territories of our state," the SBU said. Also, he repeatedly posted anti-Ukrainian articles on websites controlled by the terrorist organizations known as the Donetsk and Luhansk people's republics. SBU chief Vasyl Hrytsak said that after Ukraine introduced entry restrictions for Russian nationals, the Russian special services have been more actively engaging foreigners in their acts of provocation. "The activity of such Russia-paid propagandists poses a threat not only to Ukraine's national interest but also contradicts the legislation of their country of origin," Hrytsak said. In December, Russia's Channel One showed a feature about a "disappointed Ukrainian" who turned out to be a Minsk resident.